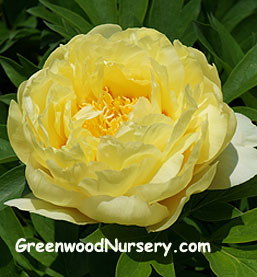 Bartzella Peony is a shrub like garden plant peony that is a massive producer of beautiful double bright yellow flowers that glow against the dark green foliage. Paeonia x 'Bartzella' is a strong stemmed, vigorous growing peony that requires no staking. Hybridized by Toihi Itoh in the 1940's, the Itoh Peonies are a cross between tree peonies and herbaceous peonies producing large flowers and large foliage. The Bartzella Itoh Peony grows 2 to 3 feet tall and wide, blooming in late spring to early summer. Plant your yellow peony in full sun to partial sun. Water weekly and more during extreme heat. As with other perennial peonies, they grow best in slightly acidic soil. Peony bulbs are best planted in fall. Plant bulbs 2 inches below the surface of the soil with buds facing up and then mulch. Prune foliage to ground in fall. It is normal for the Bartzella Itoh Peony to take several years to begin blooming once planted. Pair with the First Arrival Itoh Peony. For more information on growing the Bartzella Itoh Peony, visit Learn to Grow.